Restaurant Week is probably my favorite two weeks of the year. I mean, I love Christmas, but Restaurant Week allows me to have a fabulous meal that someone else cooks and cleans up after. That’s love. This year I had the most handsome date on the planet…my sweet son, Ty. 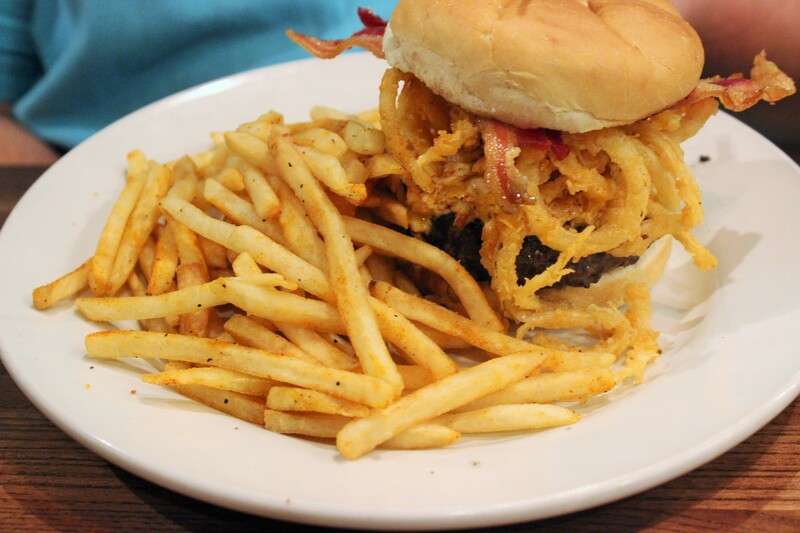 We went to Twisted Oak Bar & Grill in Statesville. It is located in Statesville’s charming downtown area, and in a factory-esque building. It is not facing the road, the front entrance is on the side. When you come up the ramp you’ll see a nice outdoor area with a fireplace and several seats around. Very cozy! The interior is spacious and homey with exposed brick and minimalist decor. I loved it. Also, on this night, they had live music. Twisted Oak serves breakfast Monday – Thursday and the pictures I saw looked amazing. If I am ever near Statesville early in the morning, that will be my first stop. Lunch and Dinner are served Monday through Saturday. As you know, Restaurant Week has a limited menu…3 courses for $30 each. What a deal! We both skipped the wine they offered at the beginning of the meal and opted for tea and water. The first course was a great start to a terrific meal. I got a delicious garden salad with a tangy and creamy homemade Ranch dressing. I love some salad. Ty got Peirogies. 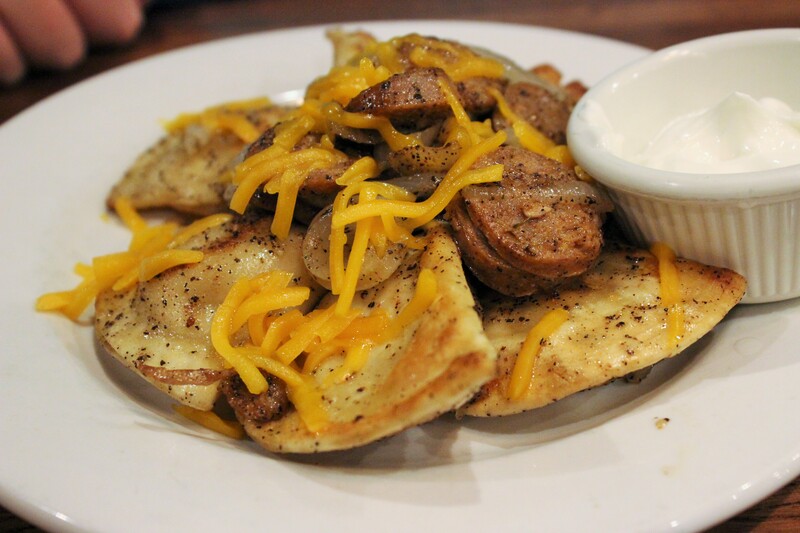 If you aren’t sure what that is, it’s a potato dumpling that is pan fried and tossed with caramelized onion and andouille sausage and topped with sour cream and cheddar cheese. Ty hit the jackpot with these. A HUGE plateful and they were the best peirogies I’ve ever tried. The outside was crispy and chewy and the inside was soft and creamy. I would order this and my salad for my meal next time! For his entree, Ty opted for the Pimento Burger. It was a 1/2 pound Angus beef, cooked to medium atop a toasted bun slathered with melted pimento cheese, fried onion, bacon, lettuce and tomato (he opted out of that) and served with French fries. He said the burger was very good and the fries were homemade and perfect. 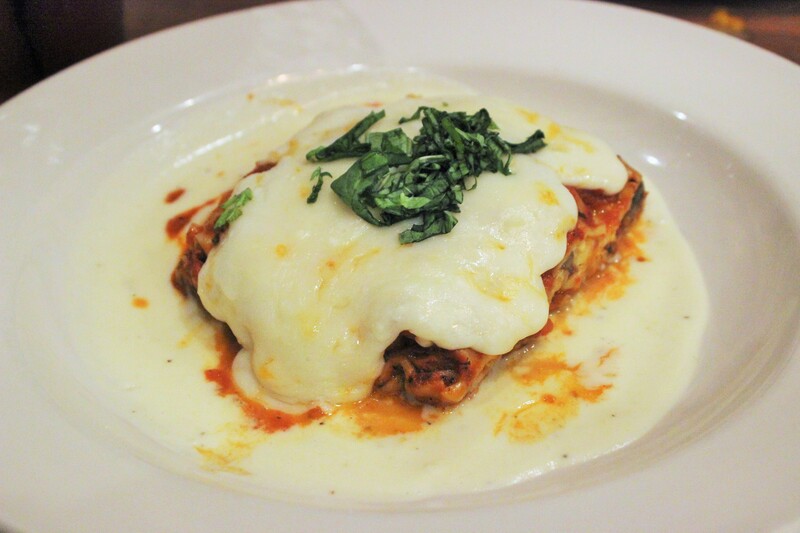 I got a special selection that was made just for Restaurant week: Beef Short Rib Lasagna. Tender bits of slow roasted short ribs in between pasta sheets with cheese, mushrooms and topped with a tangy and robust tomato gravy, Bechamel sauce and mozzarella cheese. So decadent, I had to take home half of it so I could enjoy dessert! Our dessert choice was the 5 Layer Chocolate Cake. 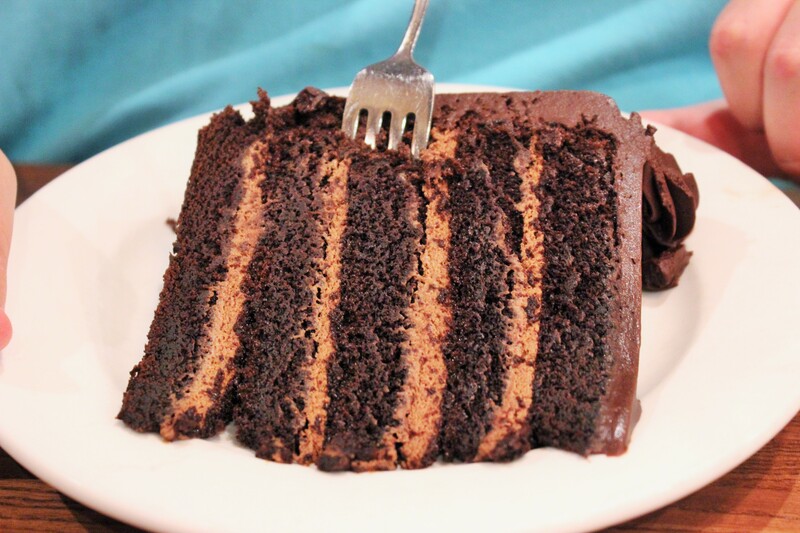 It was a huge slice of moist chocolate cake with plenty of rich, fudgy frosting. Satisfying to any chocolate lover! We gave this comforting restaurant two thumbs up and will be dining there again very soon!